It’s the last week of January. Are you on track with your 2016 New Year’s Resolutions? If so – congratulations! If not, don’t despair. It’s not too late to recommit to them. When you do, consider adding a “green” resolution to the mix. 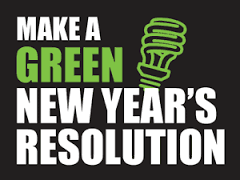 It’s not too late to make a “green” resolution for 2016! A green resolution is simply an action that helps the planet by protecting resources like the air we breathe, the water we drink, and the land and seas around us. It can be big or small, but the most important characteristic is that it’s something you’ll actually DO. Because little actions do make a difference. A green resolution may take you slightly out of your comfort zone – or not. And there are so many simple actions to choose from that it’s easy to find a green resolution that fits your life. By picking just ONE of these, you may re-charge your whole “resolution” mindset for 2016. Look for the Energy Star label. Energy Star has been around for a couple of decades now. It produces annual lists of the most energy efficient models of many different products. So whether you need to buy a new refrigerator or TV, a new air conditioner or laptop computer, the Energy Star website has got you covered. Remember that the true cost of an appliance includes the purchase price AND its operating costs. So why not buy a TV that costs the least on your electricity bill, while still fully enjoying the Big Game? Adjust your heating and cooling. According to the Center for Climate and Energy Solutions, some 38% of total U.S. carbon dioxide emissions come from buildings. A big part of THAT comes from running your heat or your air conditioner. So if you want to make a measurable difference, turn down the heat in winter and turn up the air conditioner in the summer. If you leave the house empty during the day, a programmable thermostat that automatically drops the temperature 10 to 15 degrees – and warms it in advance of your return – can save 5% to 15% of your annual heating bill, according to the U.S. Department of Energy. 4. Turn the faucet off when you brush your teeth or shave. According to the U.S. EPA, if you turn the water off while brushing your teeth in the morning and evening, you can save around 8 gallons of water a day. That’s 2,920 gallons a year that won’t go needlessly down the drain. 5. Sprinkle your lawn only when needed. In 2015, the Tampa Bay area got about 16 extra inches of rain above the average annual amount. There’s no need to sprinkle when there’s an excess of free water coming from the sky. Open your umbrella and shut off your irrigation system until it’s truly needed. 6. Rethink your laundry habits. Newer front-loading washers use just one third the amount of water compared to the older, top-loading machines. (It’s amazing to look through the washer’s window and SEE the difference.) Wash full loads so you do fewer loads overall. Wash in cold water to avoid the GHGs from heating the water. Be sure to check the Energy Star site to find the most energy efficient washer too! 7. Buy organic food. Organic foods are grown and processed with fewer herbicides and pesticides. This results in a couple of things. The farmers who grow organic food create less chemical runoff, which can pollute rivers and oceans. And you and your family eat more healthily. Find organic foods too expensive? Then pick some key food items and buy THEM. The Environmental Working Group puts out a list annually of produce called the “Dirty Dozen” and the “Clean Fifteen.” It’s an easy way to know what to avoid, and where you might choose to put your money when it comes to creating healthy meals. 8. Avoid plastic bags and bottles. Plastic takes hundreds of years to biodegrade. So bring reusable bags when you shop. Bring a mug to the office for your morning coffee or tea. Buy a reusable water bottle and use it daily. If you DO find yourself with plastic bags or bottles – recycle them! Many retailers – from your grocery stores to places like Target – generally offer bins that take back these items, in case your house or apartment does not have a recycling service. 9. Get social. Think “going green” is some weird activity that only hippies and hermits do? Think again! Participate in a local beach cleanup, join a local chapter of the Sierra Club for outings, or sign up for a local community-supported agriculture membership – and meet your neighbors! Going green is all about working together to keep the planet habitable for humans. It’s about as “people-oriented” as it gets! 10. Get more information. There are plenty of books like “Green Life Style 101” and websites like greenlivingonline.com. You can do a deep dive on the subject or take it in little bits. Then choose a green resolution that fits your life and just do it!